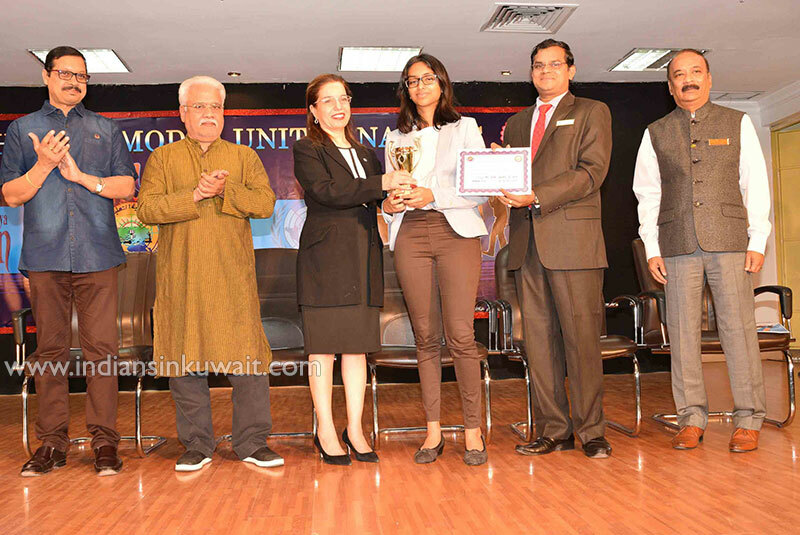 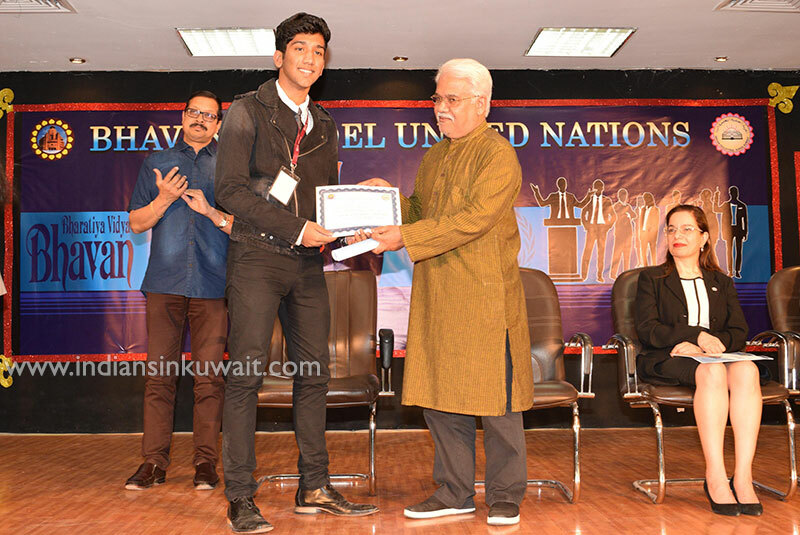 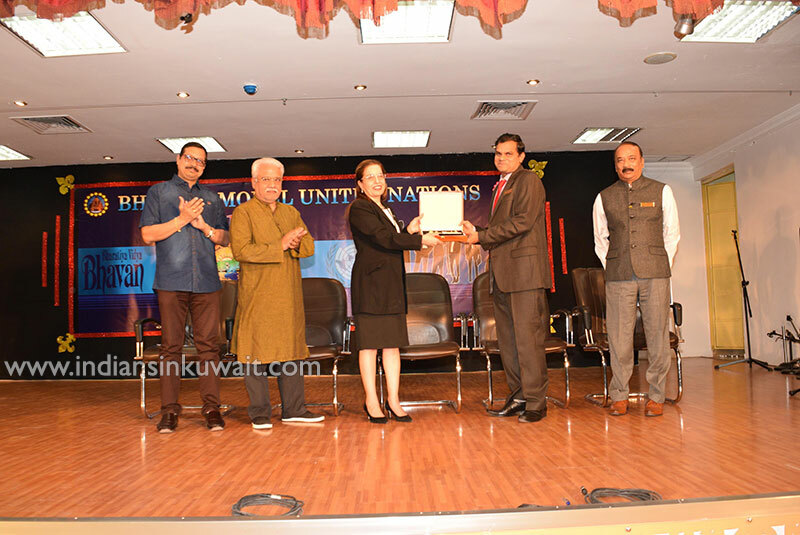 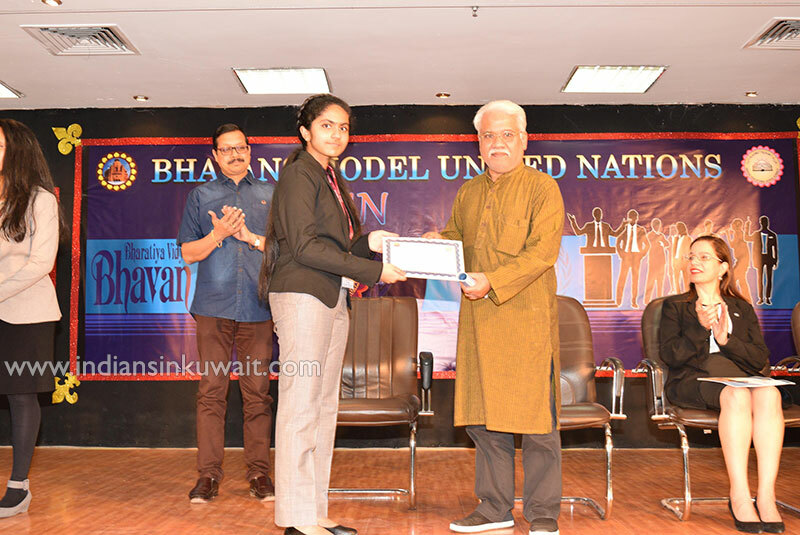 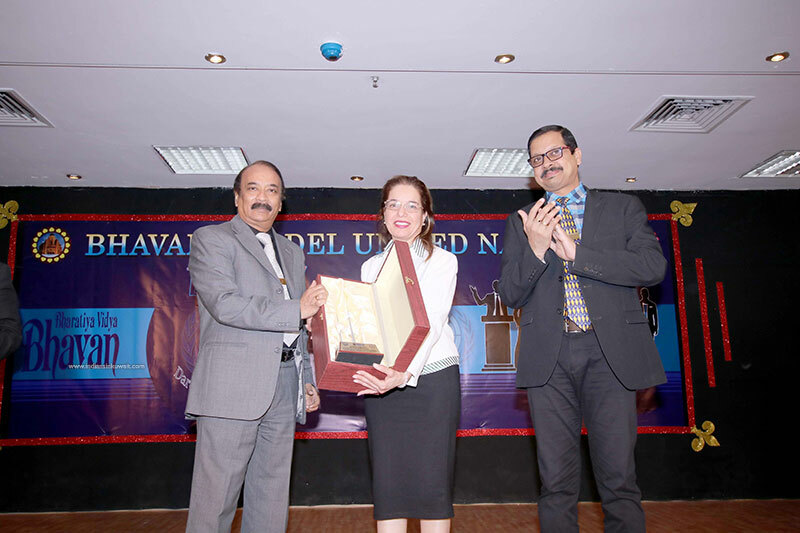 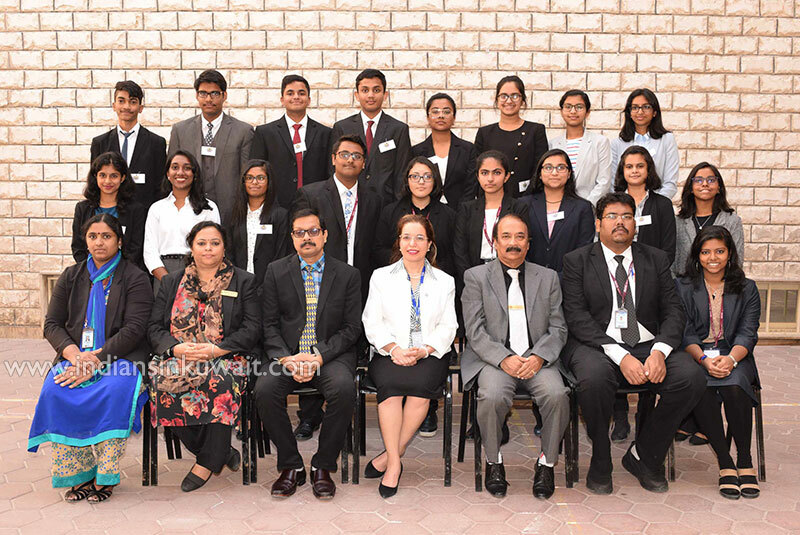 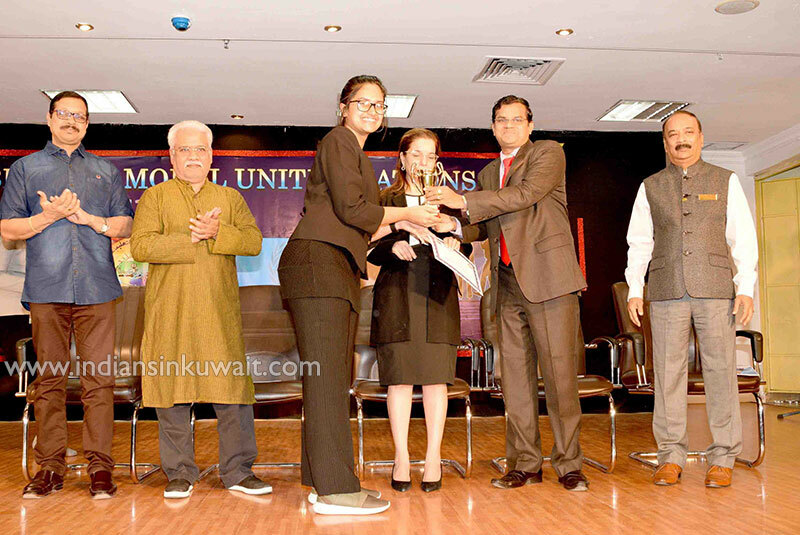 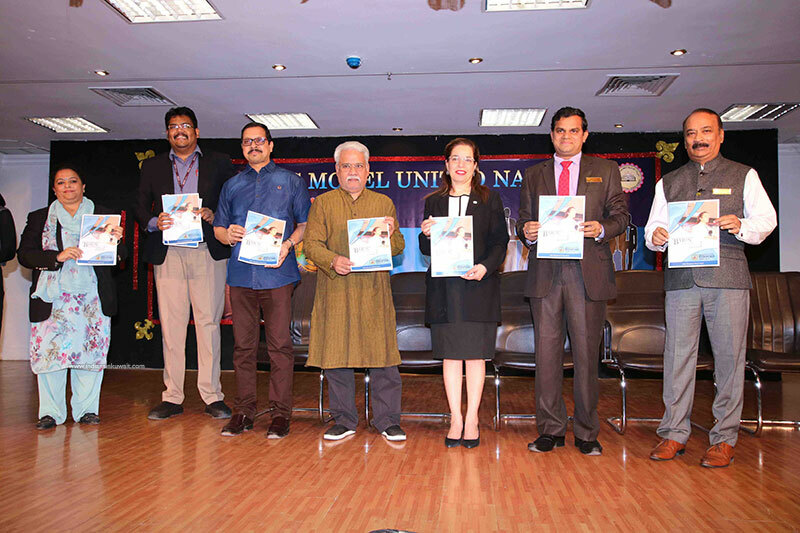 The fifth edition of Bhavans Model United Nations, a one-and-a-half-day event was convened at Indian Educational School, Kuwait on November 29 and 30, 2018 with a formal inaugural ceremony graced by Dr. Ameera Al-Hassan, Acting Head United Nations Human Settlement Programme, Kuwait, as the Chief Guest for the day of deliberation. 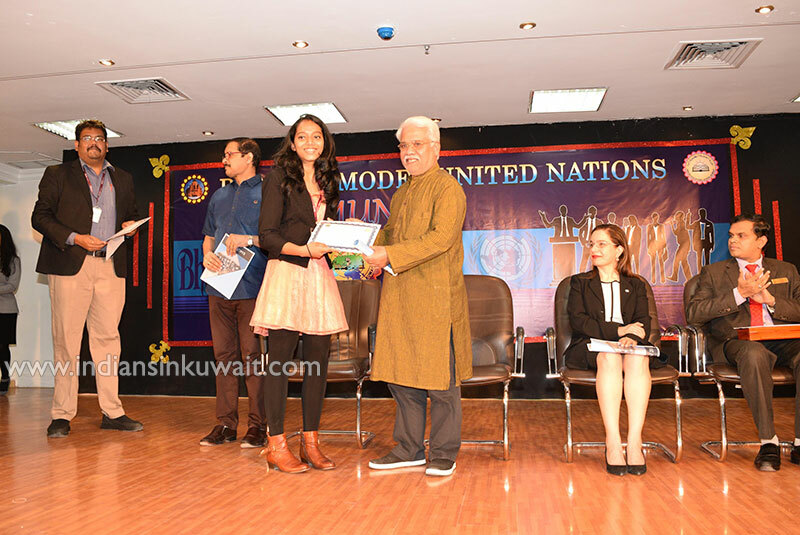 The proceedings of the day rolled on with the recitation of the Holy Quran followed by the Kuwait National Anthem and the traditional lighting of the lamp. 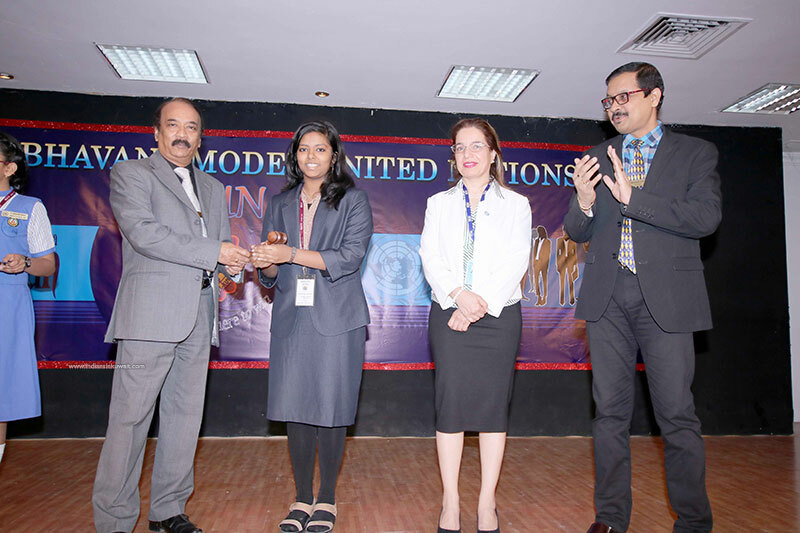 Sana Nazim Parkar welcomed the august gathering and briefed everyone about BMUN 2018. 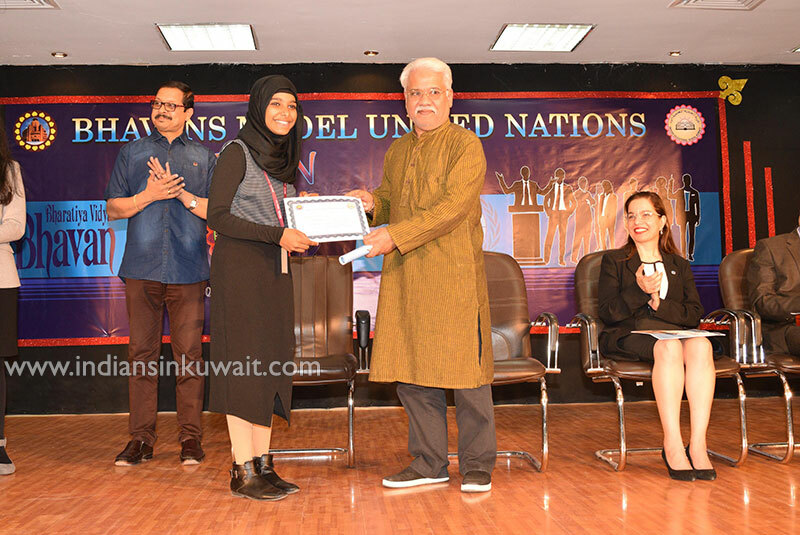 Dr. Ameera Al-Hassan enlightened the gathering with a thought-provoking speech, which had indeed a tranquilizing effect on the listeners. 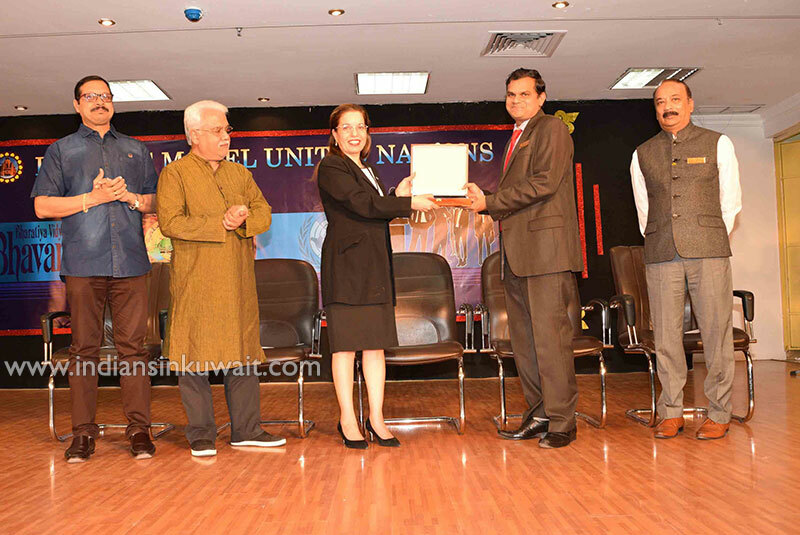 She gratefully mentioned the Honorable Amir of Kuwait’s generous contributions towards the United Nations Human Rights Council. 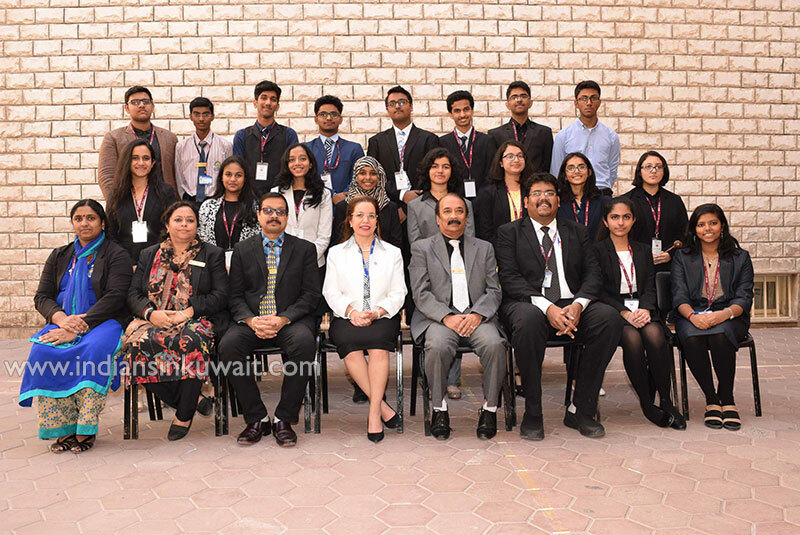 Dr. Ameera Al-Hassan also called for a collaborative effort by the student community and the UN for achieving a society which is technically advanced and based on humanitarian values. 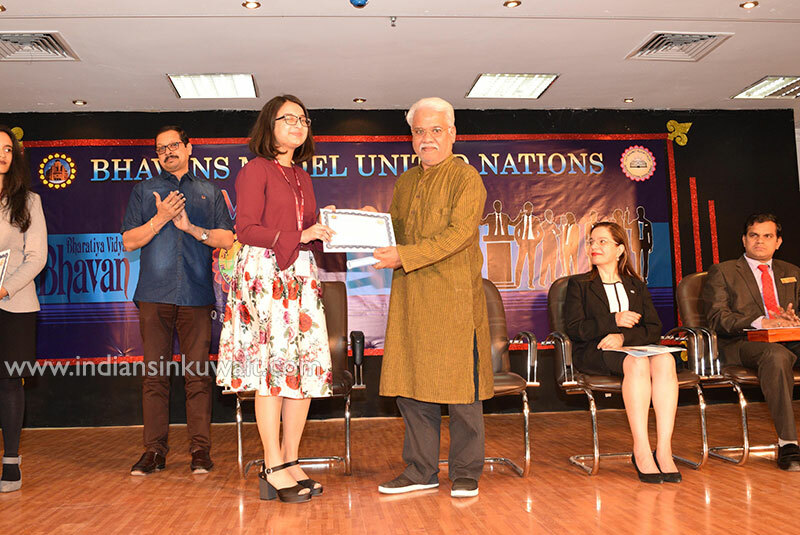 She emphasized the fact that today's youth, the future diplomats, should have the ability to solve problems and to shoulder responsibilities for which these kinds of simulations of the UN pave a path. 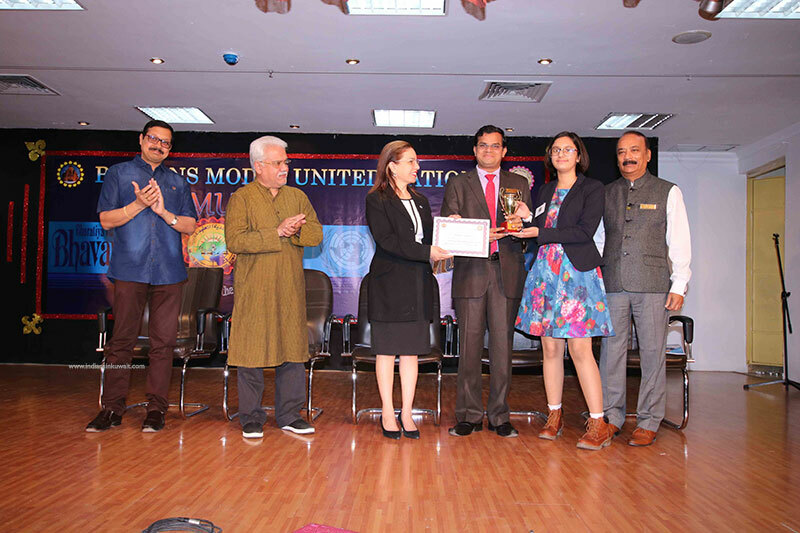 She applauded the painstaking efforts taken by the Bhavans MUN Club for hosting such a meaningful deliberation at Bhavans BMUN 2018. 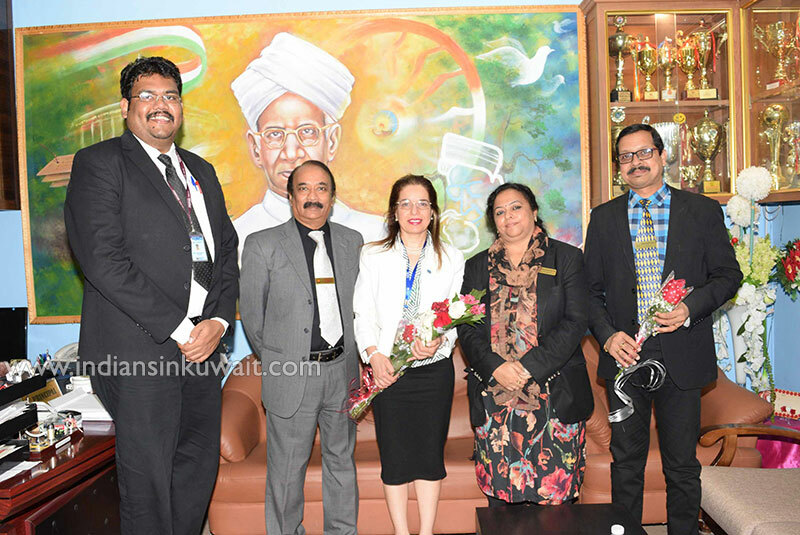 The chief guest was presented a memento and a painting by the Principals of Bhavans, Kuwait as a token of love and appreciation from the Bhavans Fraternity. 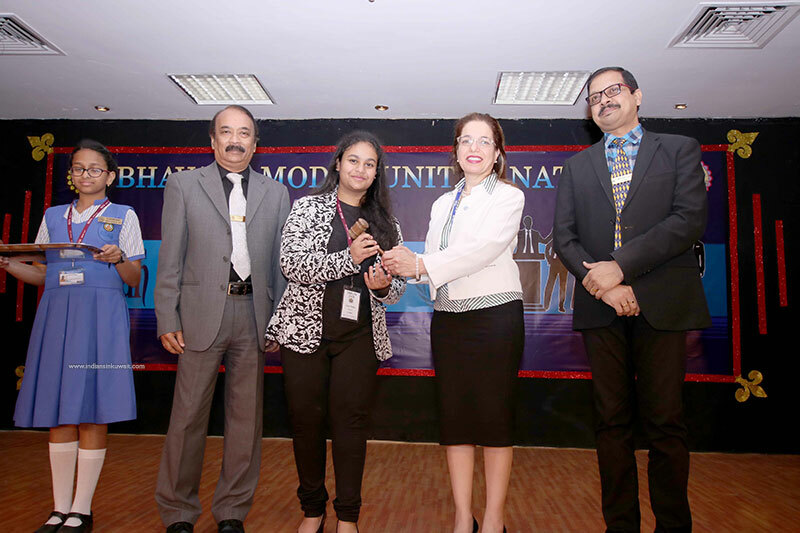 The ceremony gathered momentum with the “Gavel Handing Over” by the chief guest to the committee heads. 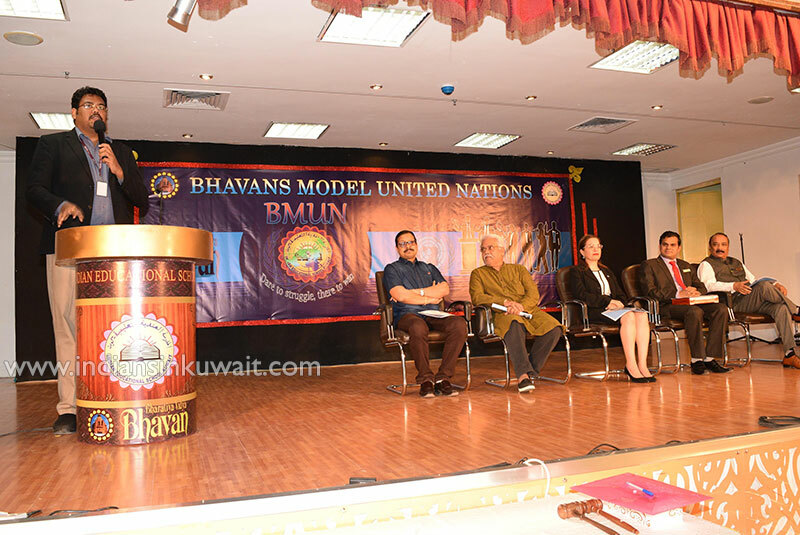 The Secretary Generals, after introducing all the heads of the committees, declared the BMUN 2018 open. 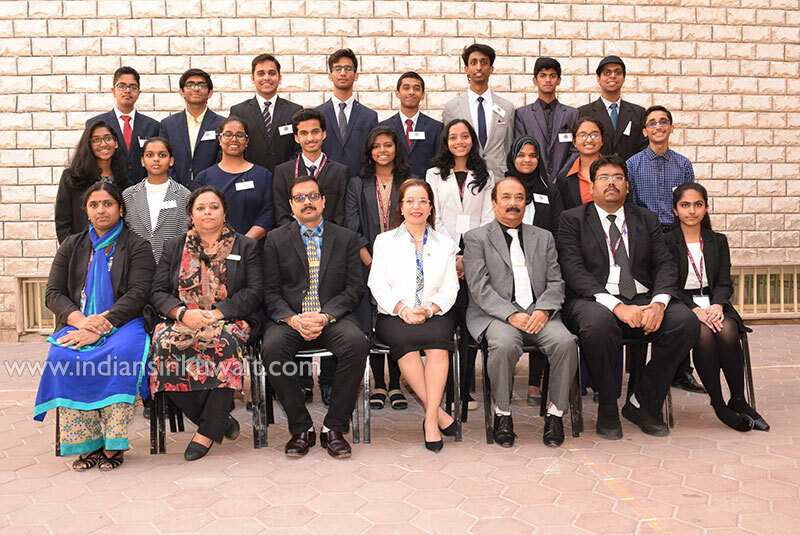 After a while, the council adjourned for a photo session. 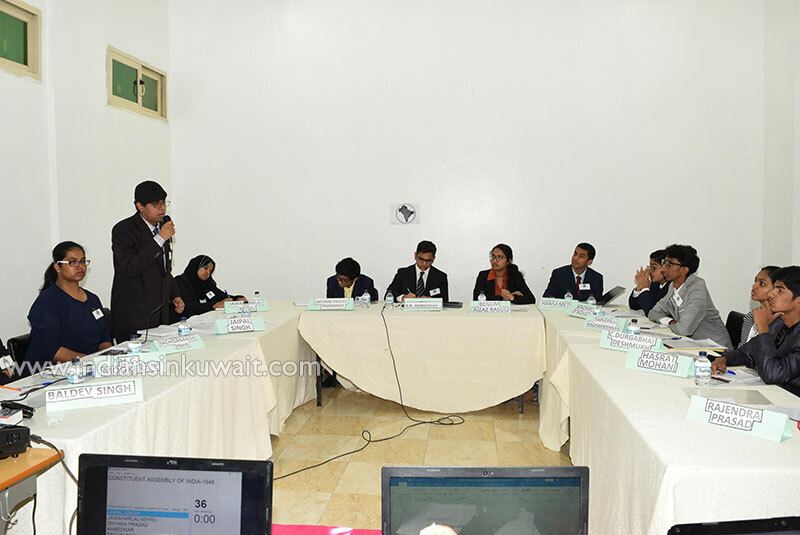 The simulation witnessed a strong clash of ideologies of 70 potential contestants representing various schools in Kuwait. 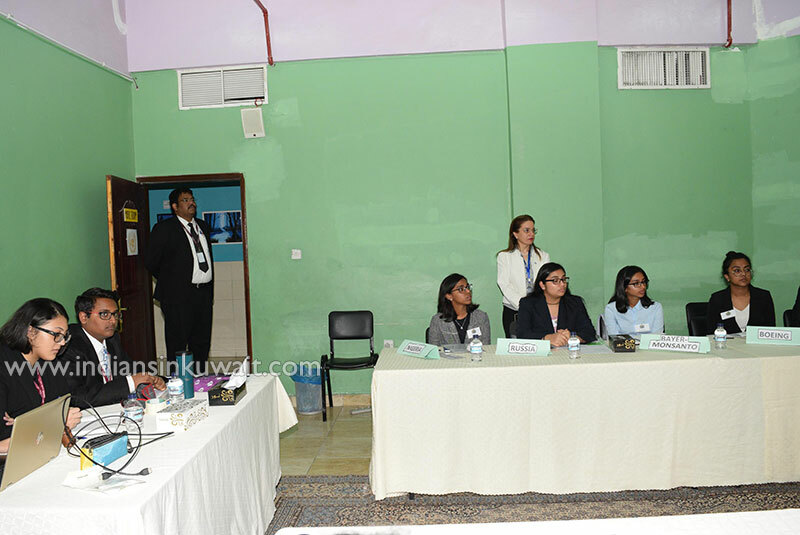 The fifth edition was diverse by all means as there were four parallel committees viz. 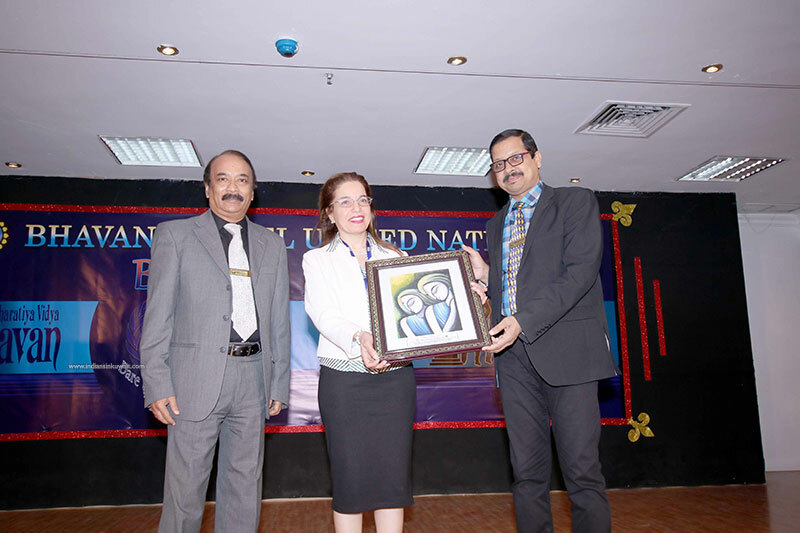 United Nations General Assembly (UNGA) deliberating on preventing and combating human trafficking in global context, United Nations Human Right Council (UNHRC) debating on the issue of violations of basic human rights of women and children in the third world countries, United Nations Security Council (UNSC) debating on the topic of assessing and responding to non-state actors/the influence of non-state actors on global politics and The Indian Constituent Assembly of 1948- Drafting Committee (Historical Committee), an unconventional committee, which is first of its kind on a UN platform bearing the responsibility of discussing the various aspects of a formal document governing the country. 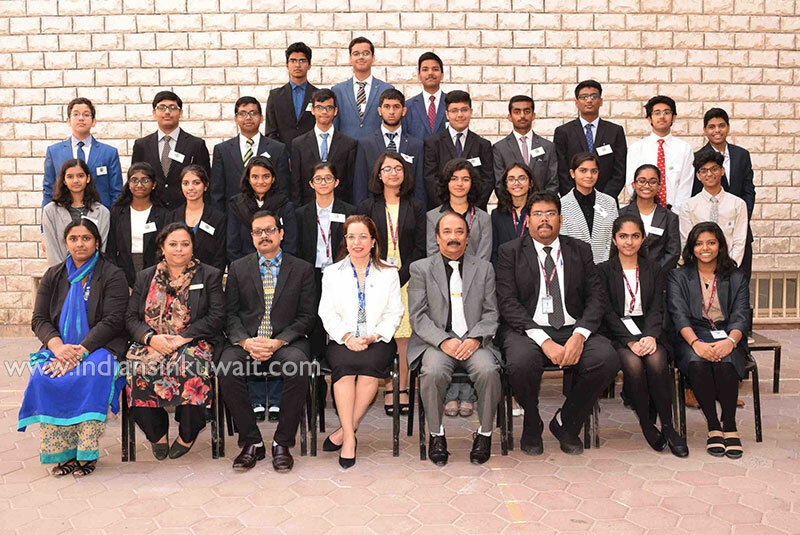 Summit of excellence was put up by the MUN core committee. 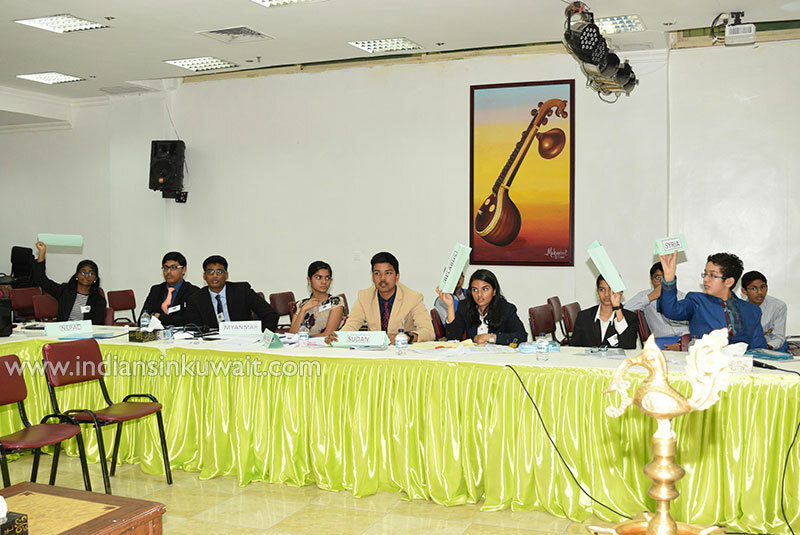 The committee was adjourned by 3 in the evening of the first day with updates leading to its next day’s progress. 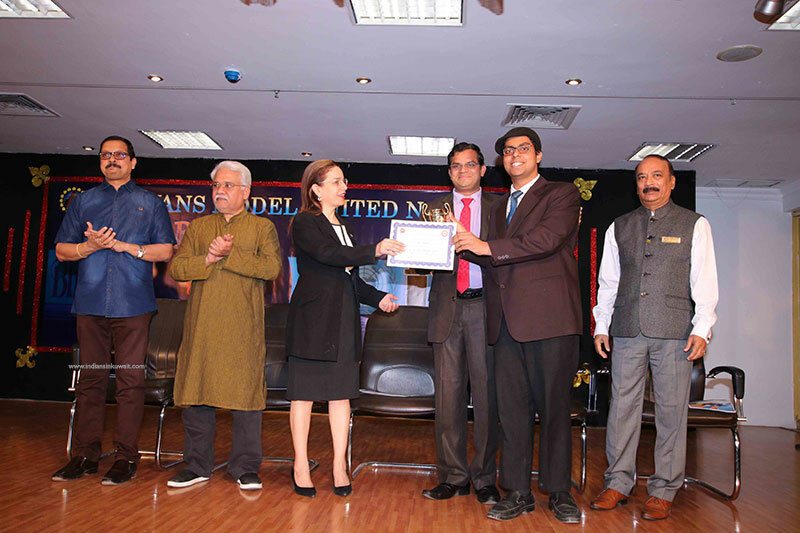 Day two of the event started well on time sharp at 8:00 in the morning with the delegates back with a bang shaking off the early wintry slumberous demeanor, determined to make a mark on the heated yet composed and poised platform of deliberation. 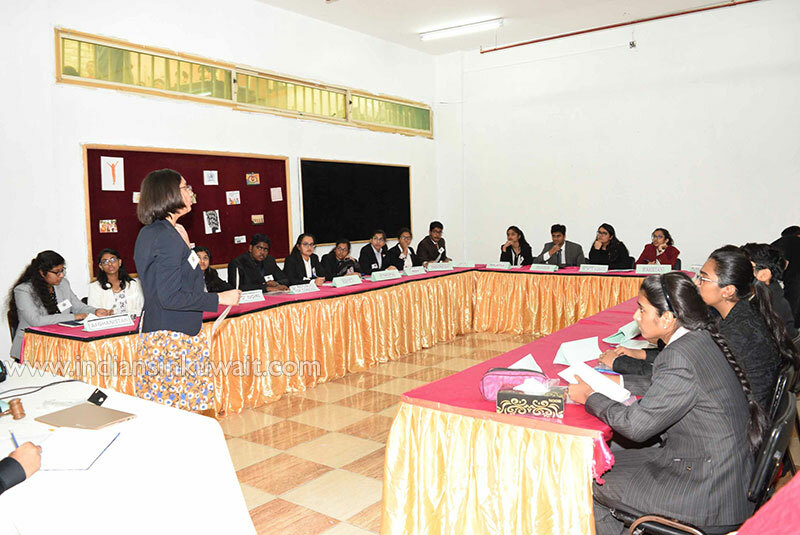 The committee proceedings had the framing and voting of the draft resolutions officially drafted by different blocs within the committee. 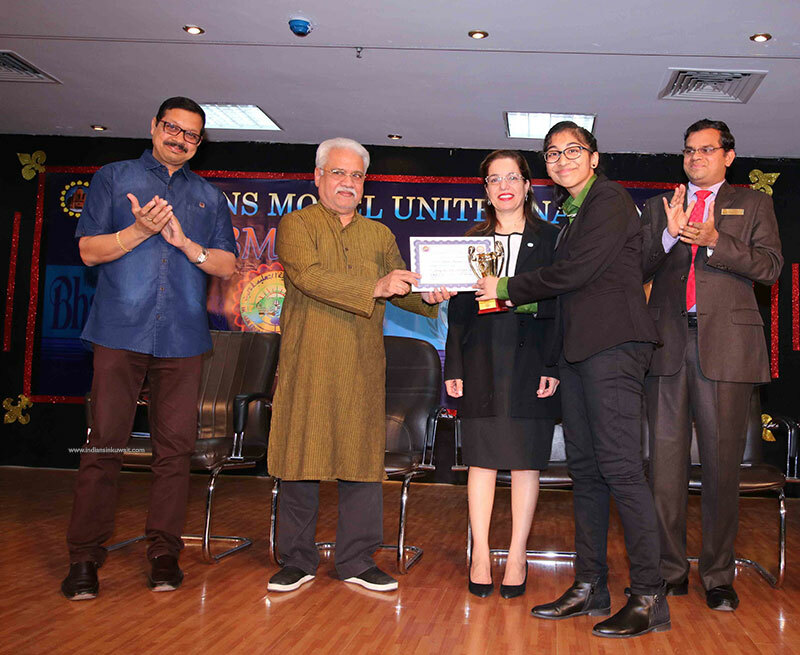 By 11:30 am, the official proceedings of the valedictory function started with the screening of a video flashing the features of the event. 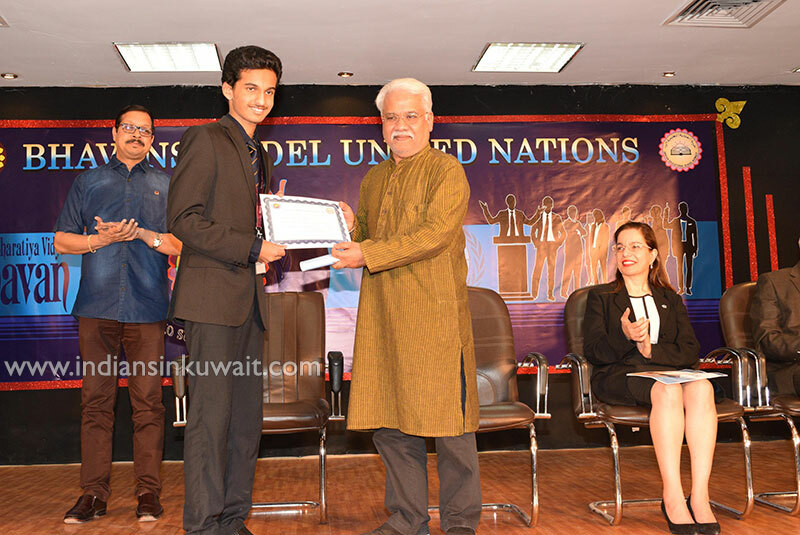 The Chief Guest for the day, Mr. Arul Dharmaraj, Principal, Integrated Indian School, Kuwait presided over the proceedings. 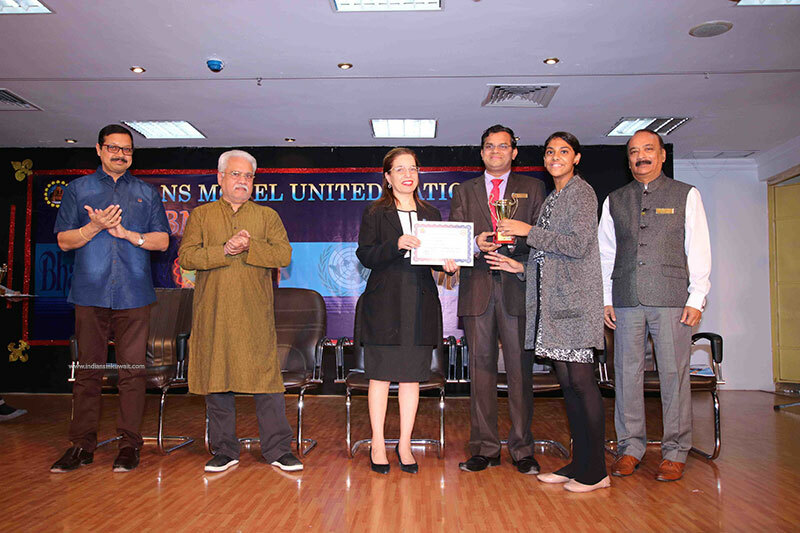 The emcees of the day, Karthik Sudheer and Fiza Shafeeque welcomed the guests, dignitaries, delegates and the faculty advisors to the event. 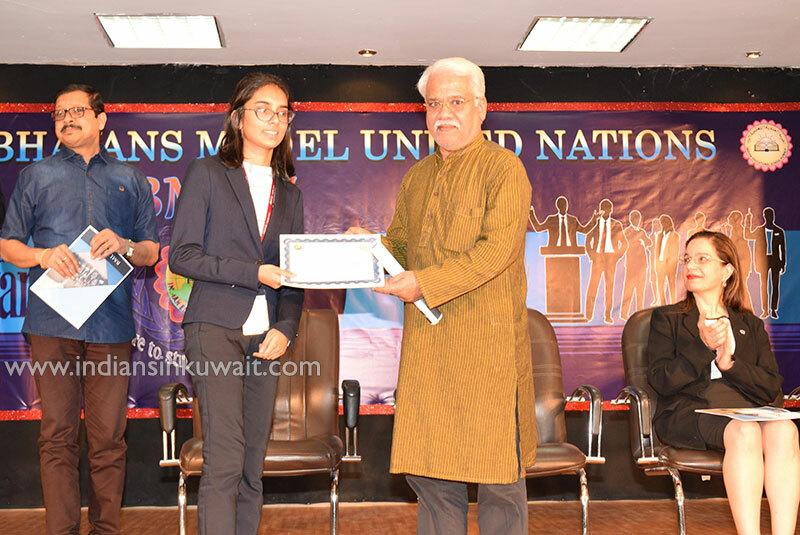 The much-awaited moment of the event, the prize distribution ceremony, was hosted by the members of the organizing committee of BMUN -2018. 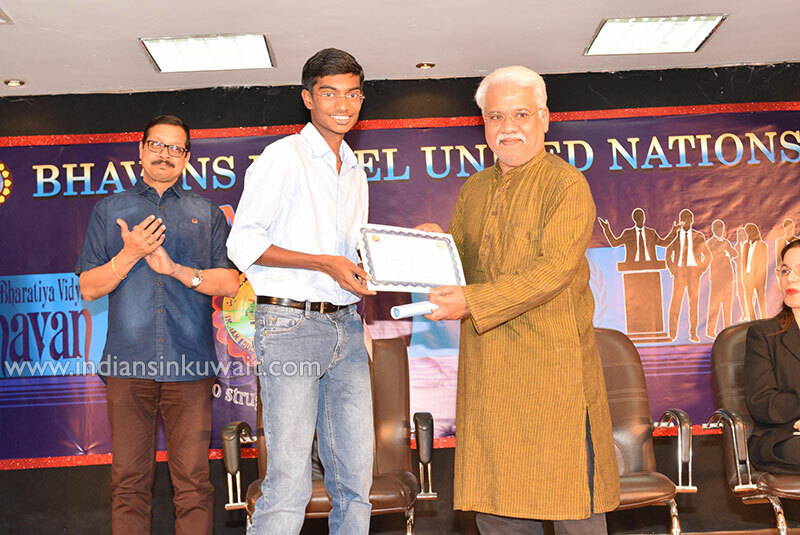 Mr. Suresh. 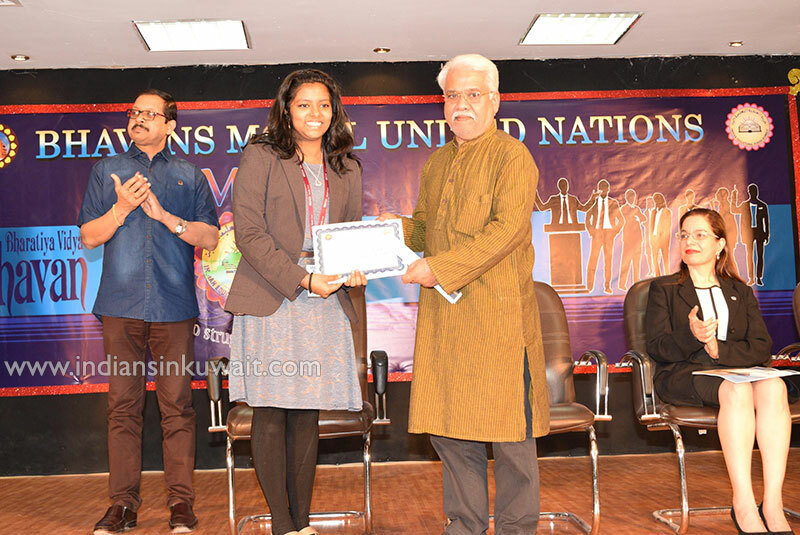 V. Balakrishnan, Vice Principal, Senior Wing IES announced the names of the prize winners. 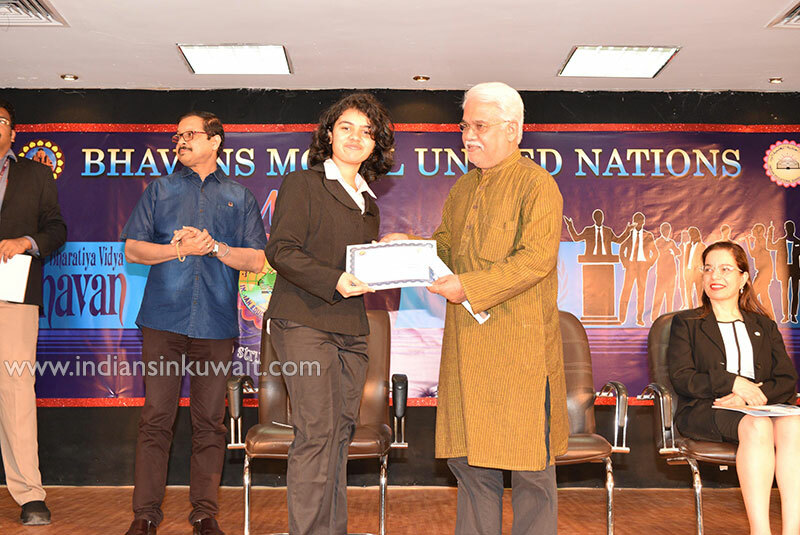 The Chief Guest, Mr. Arul Dharmaraj, the Guest of Honour for the day, Dr. Ameera Al Hassan, Acting Head of United Nations Human Settlements Programme, Kuwait, Mr. N. K. Ramachandran Menon, Chairman, Bhavans Middle East, Mr. T. Premkumar, Principal, Indian Educational School, and Mr. Mahesh Iyer, Principal, Smart Indian School, felicitated and gave away the trophies and certificates to the diplomatic delegates. 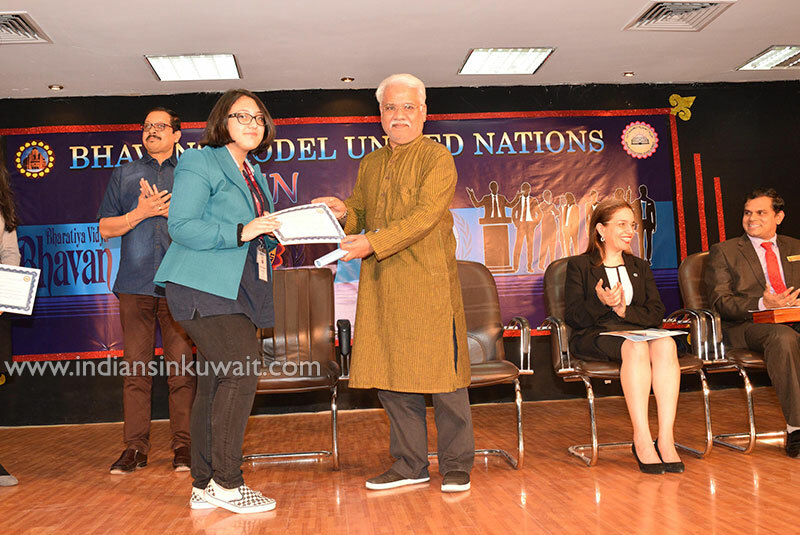 The coveted prize of the Best Delegation of BMUN 2018 was bagged by Indian Educational School. 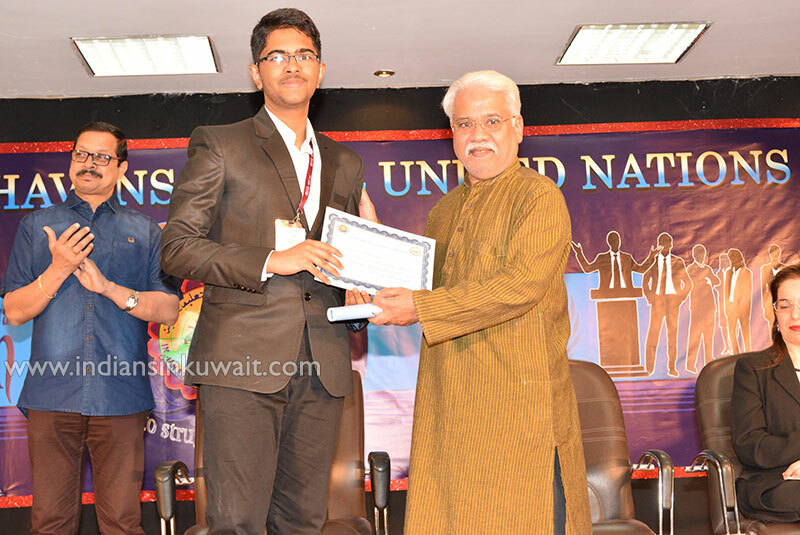 The Chief Guest Mr. Arul Dharmaraj in his address to the delegates emphasized, “The power to change is vested in you. 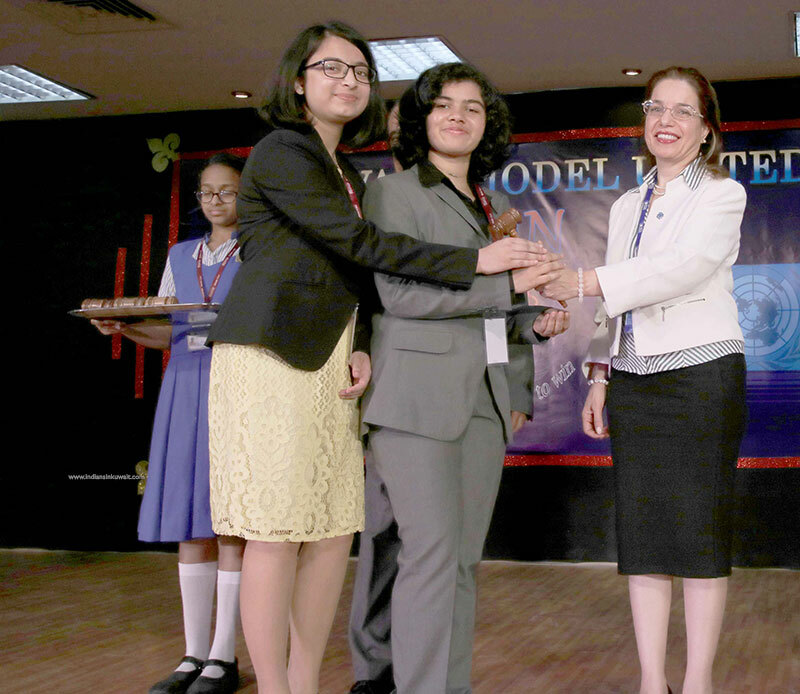 Don’t look for external role models. 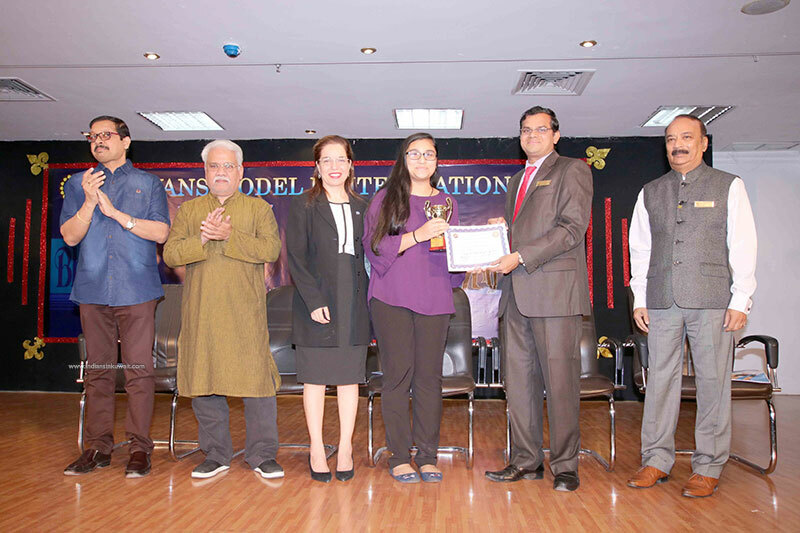 You are your own role model. 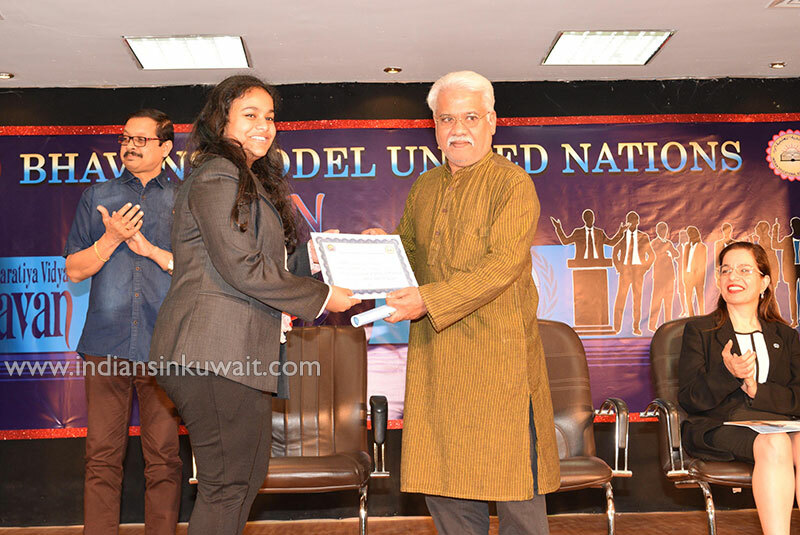 There is a lot of degradation in the value system of the current generation. 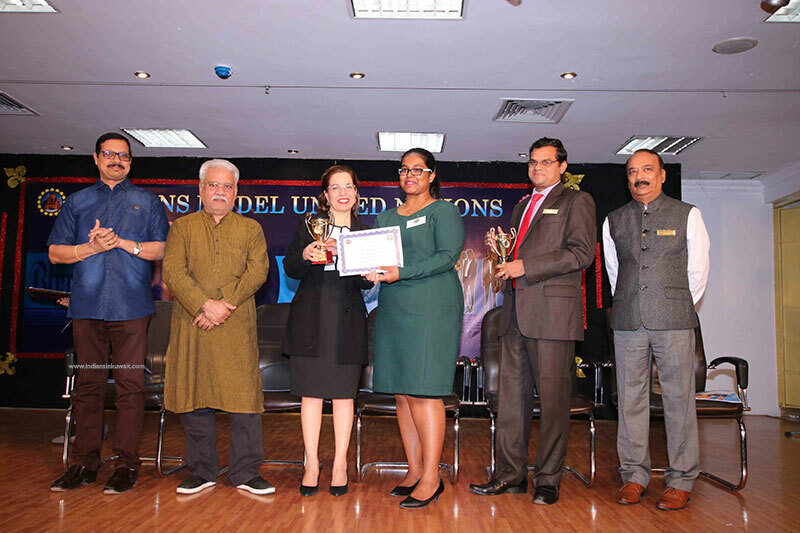 Looking at the delegates today I feel that the future is in safe hands.” Mr. T. Premkumar, Principal IES, felicitated and acknowledged the efficient portrayal of togetherness and professionalism demonstrated by the organizing committee. 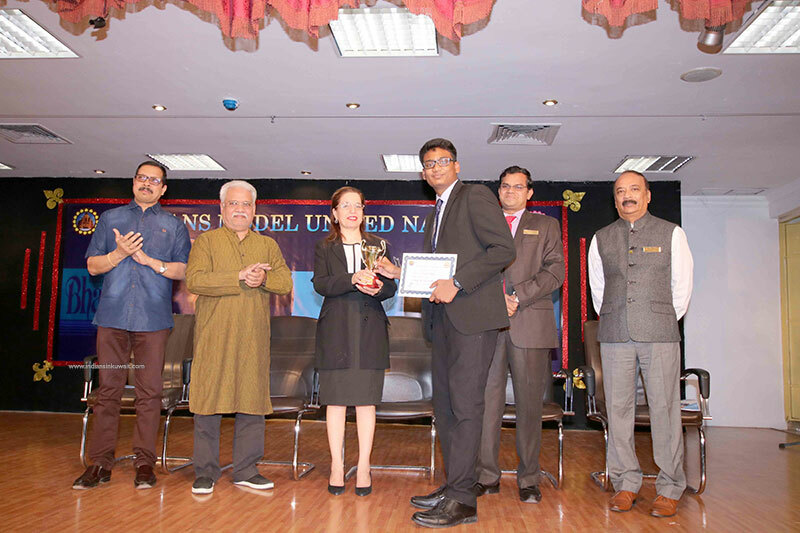 He also placed on record his appreciation for Ms. Meenakshi Nayyar, Vice Principal CCA, Mr. Sriee Aswathaman (Department of French) and Ann Bindhia Peter (Department of Social Studies) for being the organizing heads of the committee. 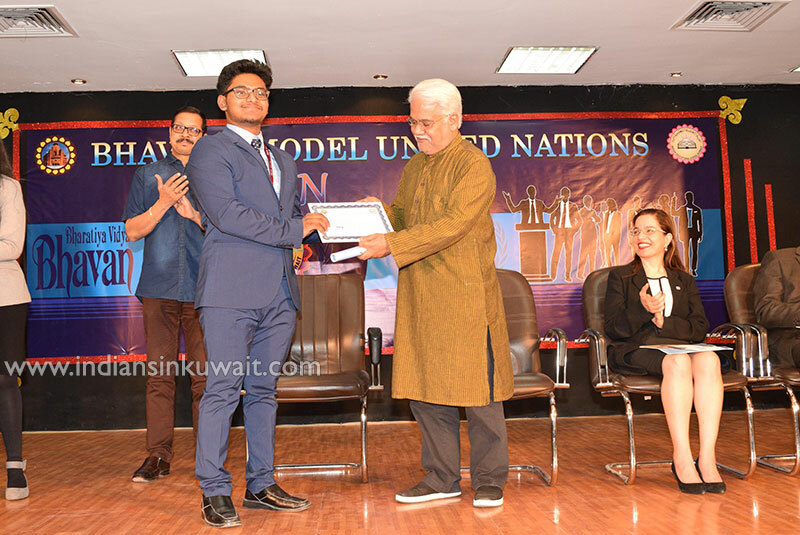 He wholeheartedly thanked the principals of the participating schools for accepting the invitation and promised that BMUN 2019 will be as interesting and purposeful as it can ever get. 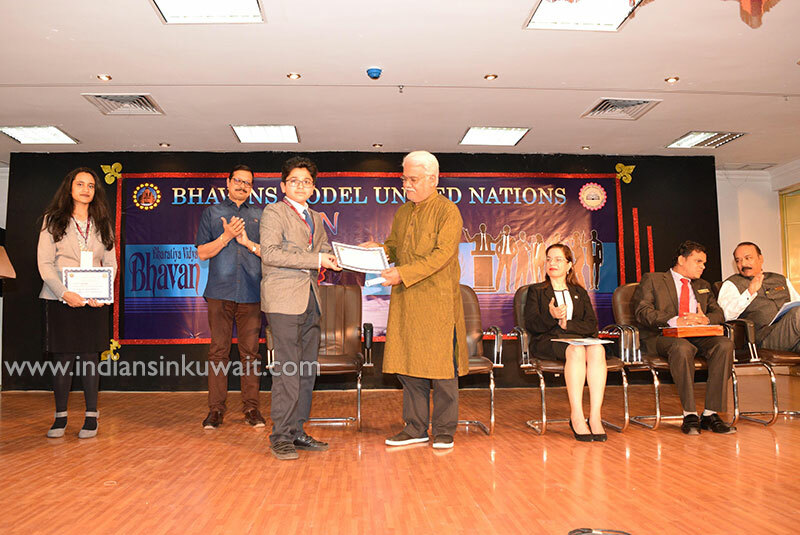 Bhavans BMUN 2018 also witnessed a rare occurrence on a UN platform. 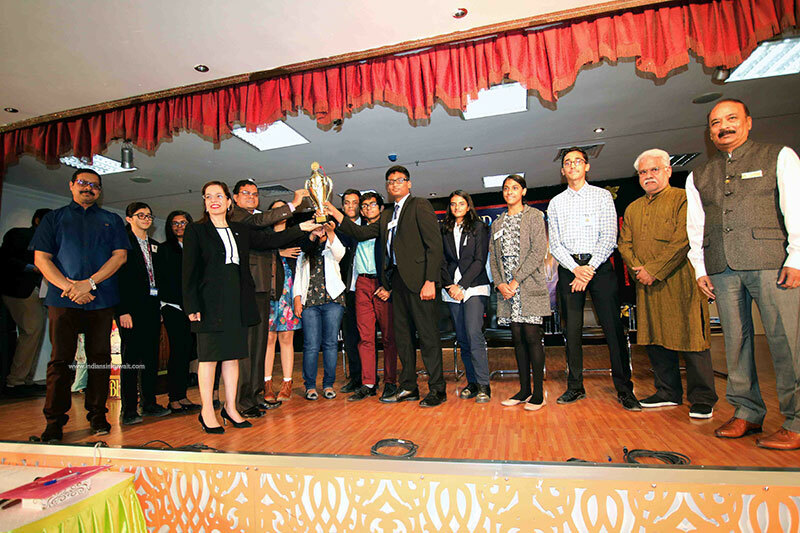 A newsletter comprising reports from various committees, reports of the proceedings by the committees and the photographs of the events was released by the Chief Guest Mr. Arul Dharmaraj amidst thunderous applause. 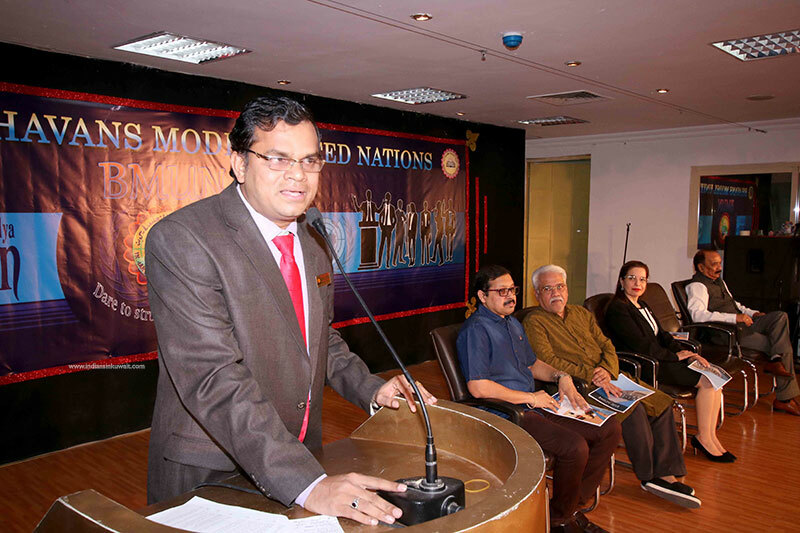 Mr. Sriee Aswathaman thanked the prominent guests for their eminent presence and support, and Mr. N.K. 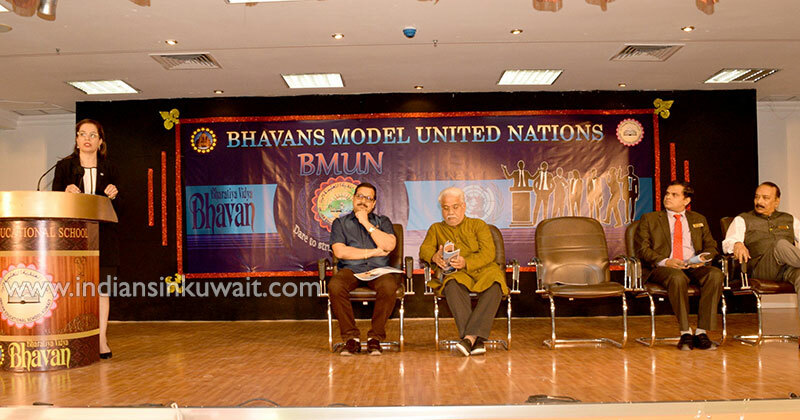 Ramachandran Menon, Chairman, Bhavans Middle East for his constant support and guidance. 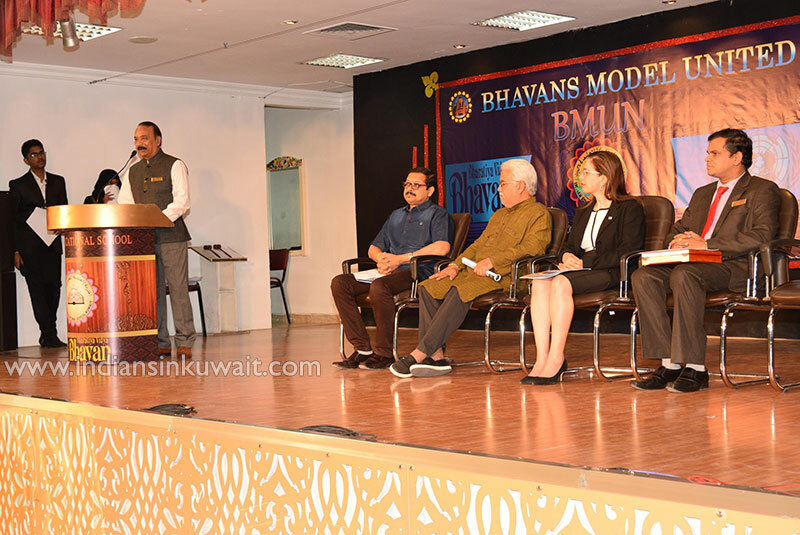 He also thanked the Principals and Vice-Principals and all the members of the Bhavans Fraternity Kuwait for the support and assistance offered by them in the smooth and fruitful conduct of the event. 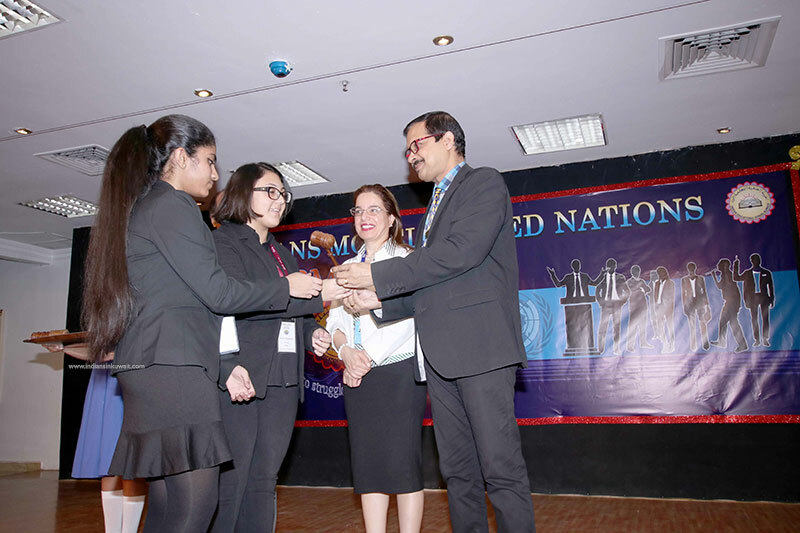 With overwhelming joy and pride, the BMUN 2018 was officially declared closed by the Secretary Generals, giving everyone enough room for relentless contemplation on the deliberated issues, and the issues yet to be deliberated at BMUN 2019.